Stepping away from this year's festival hub at 918 Bathurst, X Avant zigzagged its way down to Brunswick Avenue for a day of programming at the Tranzac. While the afternoon offered a Deep Listening intensive facilitated by Anne Bourne in tribute to late 2016 headliner Pauline Oliveros, evening programming carried the emphasis on collective consciousness later into the night with a lineup curated in partnership with LAL and artist/activist collective Babely Shades. Drawing With Knives opened up the concert programming with an impressive display of de-colonial shadow puppetry exploring a series of live folk scores about nature, fertility, and indigeneity before a seated audience, symbolic darkness and light mingling in playful, elegant displays. When bizZarh hit the stage, Dollar Paris and Charli Champ greeted the room with a call to occupy space closer to the front, encouraging the audience to vibe along: "Don't let the chairs tell you what to do." 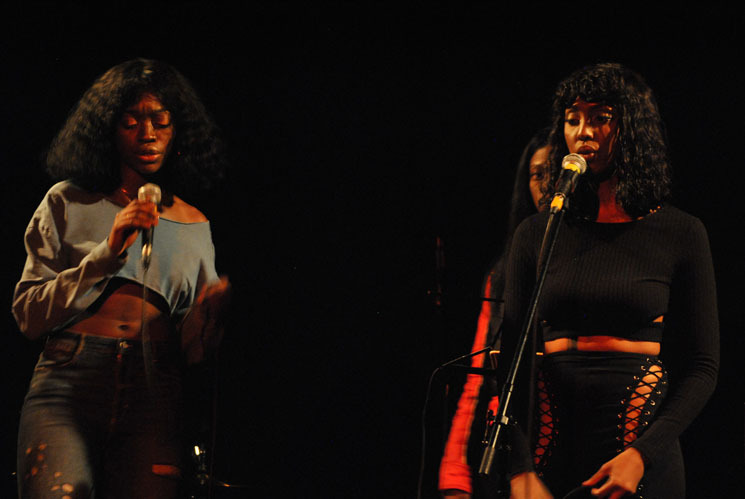 The occupy-the-front statement echoed the sentiments of a pre-show panel hosted by Babely Shades organizer Hana Jama, while speaking to the world bizZarh's music inhabits. Hypnotically dreamy and wondrous, it's powerful neo-soulquarian stuff that gets beneath your skin while simultaneously beckoning you to get outside yourself. After working an impressive beat of festival appearances, it's been a while since the pair's appeared on the local scene, so this display was especially appealing, delivering some newer material along the way. Cosmic and spiritually grounded as ever, by the end of their set, most in the crowd had left their seats behind to groove along while boho rap flows and velvety soul kisses threaded mystical harmonies around each other. Gearing up into hyper-drive, Avrha peered the chill extraterrestrial atmospheres in the blur of the rear view. A Yamantaka // Sonic Titan offshoot pitting Alaska B (drums, electronics) and Brendan Swanson (keys) against each other, this new collaborative effort brought an extended instrumental improvisation that lounged about in a bath of piano and cymbal work before catapulting into a galactic display of prog-fuelled rhythm and texture, with frenzied, intricate percussive whiplashes braking for woozy synth diversions and surreal music box solos. Trippy stuff.